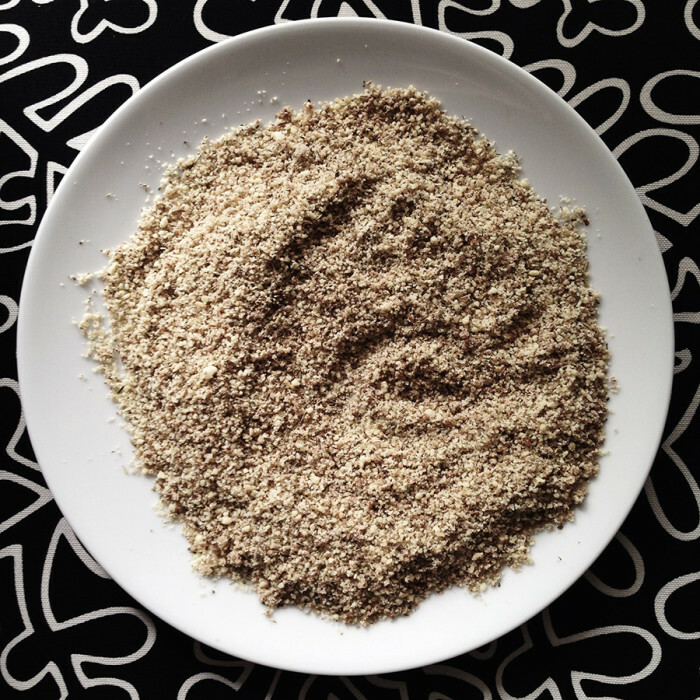 One of the main things I miss about paleo cooking is breadcrumbs. They make for delicious italian dishes. 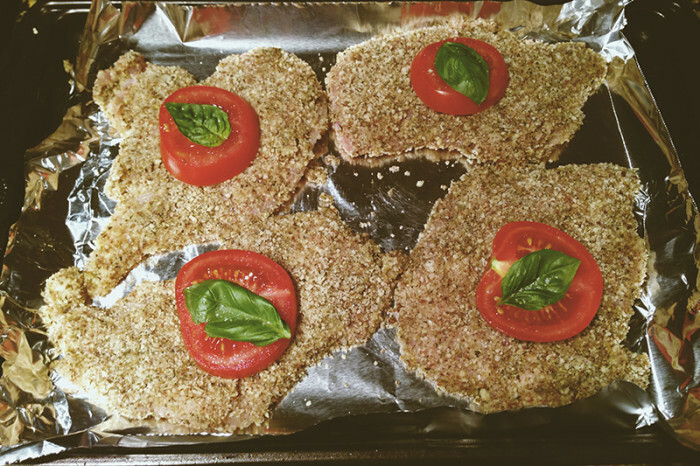 Fortunately, I’ve discovered this great alternative to breadcrumbs so I can make this delicious paleo chicken milanese. The secret ingredient: almond and pecan meal. I think it tastes even better than breadcrumbs because the nut mixture adds a delicious earthiness to the paleo chicken milanese recipe. Combine it with a delicious avocado pesto sauce and some squash spaghetti, and you have a delicious italian meal that’ll make your mouth water. Start by heating your oven to 400 degrees and line a cookie sheet with foil. In a bowl scramble the two eggs and set them to the side. This will be your egg wash for when it’s time to bread the chicken. With a food processor, chop up the pecans until they become small chunks (too much blending and it’ll turn into pecan butter). Add this to the almond meal (almond flour). Mix it on a flat plate with the 2 Tbsp of italian seasoning. This is your bread mixture. Take each chicken breast and sprinkle a pinch of salt on each side. Dip the breasts in the scrambled egg mixture, then roll them around in the “bread mixture” until it’s evenly coated. Put each uncooked chicken milanese piece on the foil-covered cookie sheet. To simulate some sauce (and to make it more beautiful), cut a tomato into four slices and put one slice on each breaded chicken piece. Sprinkle a pinch of salt on each tomato and top with a basil leaf. Drizzle olive oil on each chicken piece then pop it into the oven. 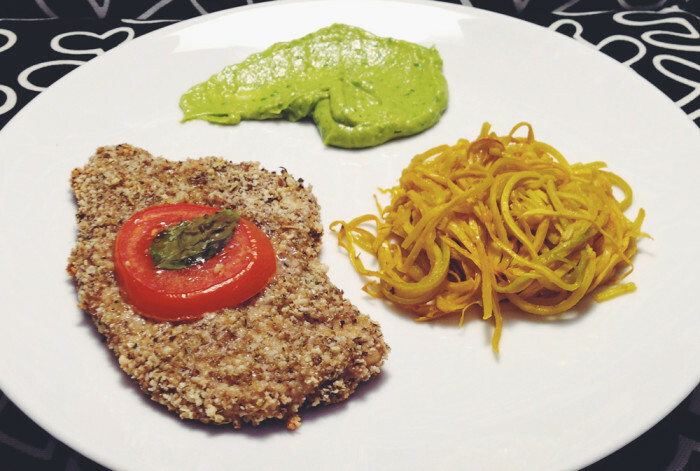 In 30 minutes you’ll have some gently crispy, delicious paleo chicken milanese. Serve it with a delicious sauce or any paleo sides. I served mine with some squash noodles (made from ordinary yellow squash) and some avocado pesto. This dish is delicious. 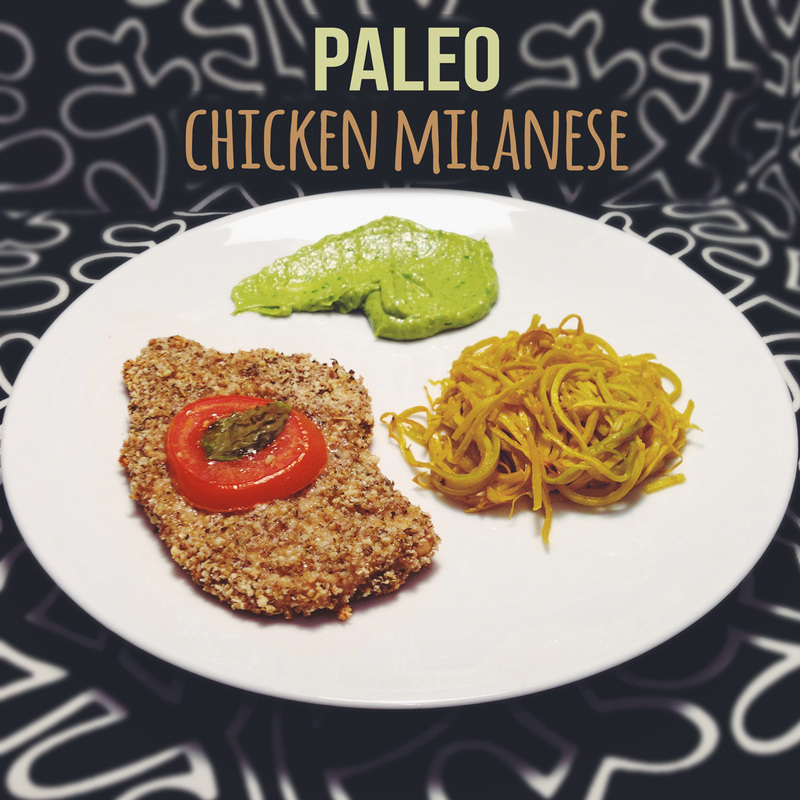 Trust me…once you go paleo chicken milanese, you never go back. 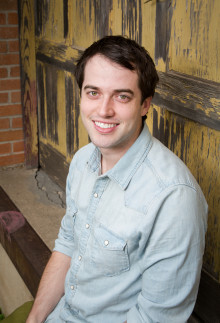 I’m so excited that you started blogging paleo recipes. I know I can trust you and your cooking to be delicious so I’m not going to have to do a bunch of trial and error recipes, suffering a few nasty dinner nights while I find good ones. YAAAAAAYYY!!!! I just made this for dinner tonight. I was delicious! Thanks.